Sweet Tea and Sisters: Who Doesn't Love Jewelry? I have always loved and had an appreciation of jewelry. My grandmother (my dad's mom) always had on at least earrings. She was so beautiful and so stylish and she would at least have on a nice pair of hoops even on vacation, at the pool, and even at the beach. My mom and aunt had given her a beautiful collection of pieces through the years. Christmas presents would be jewelry and her birthday was May 10th so she always got something really special for her birthday/Mother's Day. She passed away 6 weeks before my youngest was born. It will be 19 years in October and I have missed her every day of every year. She, like my other grandmother, lived right here and didn't miss a ball game or school function, or anything me, my sister, brother, and cousins did. She and my grandfather divorced when I was really little so she would always be at our house or my aunt or uncles. She would eat dinner at a different house each night and jump in the car and go with whoever was going on a trip. She was so classy, but so much fun at the same time. I never really thought about her being a "single mom" and I certainly had no idea my life would be like her adult life. A big difference was my grandfather lived near us and he was always around. They got along and there was never the awkwardness in most situations, including mine. We would go on vacation with her, my aunts, uncles, cousins, and not only would she go, but many times my grandfather and his wife would go also. That's such a great way and so much better for all involved, if you can have that situation. She never wanted her kids or grandkids to have to choose, but she was also a very smart lady and I think she knew she would miss out on some things if there was any other kind of arrangement. My grandfather always showed her respect and was thankful she made it easy. We lost my grandfather 8 years ago and I miss him so much too. 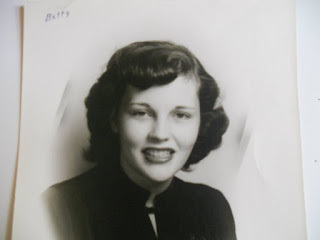 This is an old high school picture of Betty. I always thought she looked like a beautiful movie star. This was always one of my favorite. 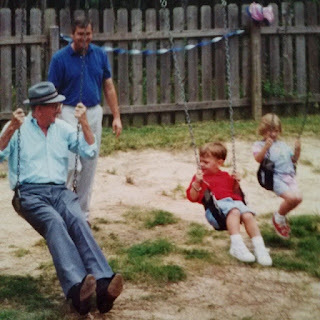 My grandfather, Tom Ed, on the swing with my dad behind him. This was a little over 18 years ago. Tom Ed is talking to my son, Shane, on the swing at his 3rd birthday party. Our cousin, Taylor, who looks a lot like our grandfather is swinging next to Shane. He would get right on a kid's level and just talk to them. Everyone loved him! My grandfather and I always had a thing between us about red birds. I was the first grandchild on both sides. It has been a tradition in my family to have kids very young so I grew up with young grandparents as well as very young parents. I called my father's parents by their names. They were in their mid 30's when I was born and they didn't think they were old enough to be called by typical grandparent nicknames. I call my mom's parents Nana and Papa and always thought it was fun to call my other grandparents by their names, Betty and Tom Ed. Tom Ed would always call me in the winter if he saw a red bird. His mom had always told him if you see a red bird in the winter, here in the south, it means snow. I am sure it is one of those old wive's tales or what people went by before the likes of Al Roker and Ginger Zee! Before so much climate change and wacky weather it would always snow within a day or two after seeing a red bird when I was growing up. As I got older and we had more weather sources (I was going to say reliable, but honestly, those old ways are sometimes the most reliable), we would still call each other if we saw one. Not long after he passed away, we all noticed something. He passed away in December and that next Spring we had what I would like to believe was a sign from him. My parents and I are still on the same street, but at the time my brother and sister and their families were here too. Our houses all lined up and one morning we saw a huge flock of red birds. We see black birds a lot and other kinds. The black birds will come in many and cover the yard, but I have never and still haven't seen as many red birds as we did that day. The young kids even noticed it. I love and miss both Betty and Tom Ed dearly. They were a huge part of my life and I know how blessed I was having both of them as long as I did. I will save my message from Betty for another post, but I will just say they both wanted to let us know they are better than ok and one day we will see each other again. I have a strong faith because of both of them. Tom Ed read his Bible everyday and Betty sang in the church choir, played the piano, and did the chidren's choir when I was little. They made who I am in many ways, but giving me such a strong faith is what I appreciate most. I wish I would have started making jewelry before Betty passed away. Tom Ed loved buying jewelry for the women in the family. Both of them never missed a chance to let me know they were proud of me, but I think they would have been very proud of my pieces also. So much more goes into them than just metal and beads. I love making all pieces, but the ones I make with crosses are by far my favorite. I just listed this necklace and it made me think about a lot of things while I was making it. You can find this in my Etsy shop.